Terence Williams initiated an investigation into Bradford Museum and Art Gallery’s portrait of Alderman H. R. Walker, JP. The painting, at the time listed as by simply ‘Evans’, sparked his interest, because it seemed to be painted in the style of William Charles Evans (1911–1978), who was Terence’s art tutor during the late 1960s. The collection had very basic records about the work, and admitted the style indicated it could be by William Charles Evans. As the work is in copyright, the PCF’s copyright team would naturally also be interested in the artist attribution. Their previous searches of the artist ‘Evans’ did not prove fruitful, but nor did searches to find the copyright holder of the work of William Charles Evans (1911­–1978), so they could not be contacted for an opinion. Alderman H. R. Walker, JP is indeed depicted in mayoral robes (and distinctive 1950s eyewear). 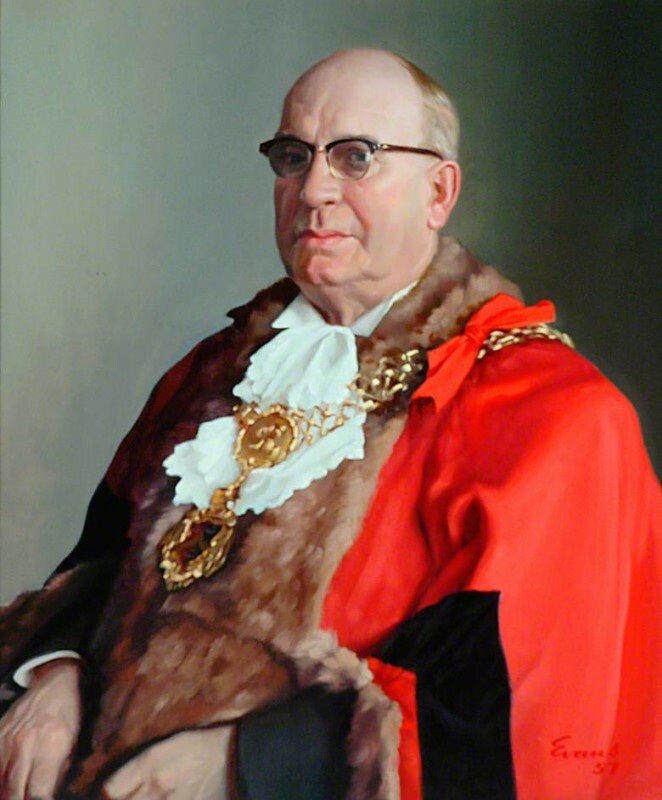 Mike Hughes noted a Horace Robert Walker was Mayor of Bradford in 1956­–1957: perhaps council records could be checked for details of the portrait? Richard Green commented that the acquisition details say the work was given to the collection in 1975, a much later year than the painting’s creation, by what may be a relation of the sitter: indicating the work was not a public commission. Andrew Greg approached the problem in a different way: he speculated upon the style of the painting. William Charles Evans’ other portraits on Your Paintings 'are all in a consistent painterly style, with prominent square-ended brushstrokes, and with a distinctive signature 'EVANS'', therefore, it seemed at first unlikely the photorealist portrait, with a different signature, was by William Charles Evans. Osmund Bullock agreed, and added it may be that photography was used to create the portrait in question. Osmund also gave more biographical details on the sitter. On the style, Terence Williams agreed there was a difference, but pointed out the date of this portrait is earlier than the others on Your Paintings. Terence also provided more information about his student-tutor relationship: William Charles Evans taught in the painting school of Bournemouth College of Art around 1967 to 1968, and Terence remarked that there may have been a Times or Telegraph supplement on the artist in the 1960s. Finding the article would certainly be helpful to the discussion, and very appealing to Terence, who seeks more information about, or photographs of, his ex-tutor. However, Katharine Eustace stated she believed that the work that of William Charles Evans, and recommended to attribute the work and close the discussion. Katharine said that although the civic-style portrait differed to his other work, and that one should be careful in making an attribution from a photograph, there were reasons the portrait could be attributed to William Charles Evans. Katharine had seen that there were no other painters with the name of Evans for the period, after looking in the Heinz Library at the NPG. Katharine continued: the signature – while different to the signature on the later portraits – was at least there, in the lower-right: which is not certain proof of William Charles Evans’ authorship, but ‘in the absence of any other contender it becomes more likely’. Besides, the work is indeed from an earlier time than the artist’s other works presented online. On the style, Katharine saw an aspect of the later square brush technique in the earlier portrait, ‘notably in the red alderman’s gown, albeit possibly toned-down for a traditional and probably conservative type of commission’. And finally, William Charles Evans did become a portrait painter of institutional figures, after all. Katharine also mentioned that further research could help resolve any uncertainty still attached to this attribution: the painting could have been a version painted for the family (since the work was given to the collection by a donor who is likely to be kin of the sitter): another version could surely have been a civic commission. The City archives would be a likely place to start any deeper investigations, as would contact with the sitter’s family. The collection is happy to accept the attribution to William Charles Evans (1911–1978). If any Art Detectives wish to contribute any more information about this portrait, the sitter, or the artist William Charles Evans, please propose a discussion by following the Art Detective link on the artwork’s Your Paintings page. Was this portrait painted by William Charles Evans (1911–1978)?